FAERS database is designed to support the FDA’s post-marketing safety surveillance program for drug and therapeutic biologic products. The Indication file contains all “Medical Dictionary for Regulatory Activities” (MedDRA) terms coded for the indications for use (diagnoses) for the reported drugs (0 or more per drug per event). 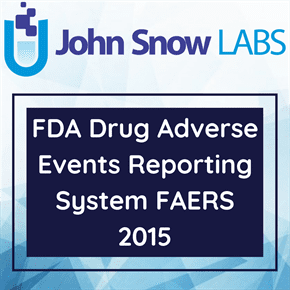 The FDA Adverse Event Reporting System (FAERS) is a database that contains information on adverse event and medication error reports submitted to FDA. The informatic structure of the FAERS database adheres to the international safety reporting guidance issued by the International Conference on Harmonisation (ICH E2B). Adverse events and medication errors are coded to terms in the Medical Dictionary for Regulatory Activities (MedDRA) terminology. FAERS is used for the spontaneous reporting of adverse events and medication errors involving human drugs and therapeutic biological products. FAERS began on September 10, 2012, and replaced the Adverse Event Reporting System (also known as Legacy AERS), which was decommissioned on August 27, 2012. FAERS is a useful tool for FDA for activities such as looking for new safety concerns that might be related to a marketed product, evaluating a manufacturer’s compliance to reporting regulations and responding to outside requests for information. The reports in FAERS are evaluated by clinical reviewers in the Center for Drug Evaluation and Research (CDER) and the Center for Biologics Evaluation and Research (CBER) to monitor the safety of products after they are approved by FDA. If a potential safety concern is identified in FAERS, further evaluation is performed. Further evaluation might include conducting studies using other large databases, such as those available in the Sentinel System. Based on an evaluation of the potential safety concern, FDA may take regulatory action(s) to improve product safety and protect the public health, such as updating a product’s labeling information, restricting the use of the drug, communicating new safety information to the public, or, in rare cases, removing a product from the market. Reporting of adverse events and medication errors by healthcare professionals and consumers is voluntary in the United States. FDA receives some adverse event and medication error reports directly from healthcare professionals (such as physicians, pharmacists, nurses and others) and consumers (such as patients, family members, lawyers and others). Healthcare professionals and consumers may also report adverse events and/or medication errors to the products’ manufacturers. If a manufacturer receives an adverse event report, it is required to send the report to FDA as specified by regulations. The reports received directly and the reports from manufacturers are entered into FAERS.